Slap Bracelets Sure Have Come A Long Way | OhGizmo! By David Ponce on 08/21/12 • Leave a comment! Remember the 90’s? Yeah, neither do we. We did everything we could to erase them from memory, consciously repressing all the neon colours, the Dawson’s Creek characters and the dated music that we could. But some memories survived. The Slap Bracelets? Yeah, we have to admit those were kind of fun. So we’re happy to see them again, even if they look nothing like their 90’s counterparts. 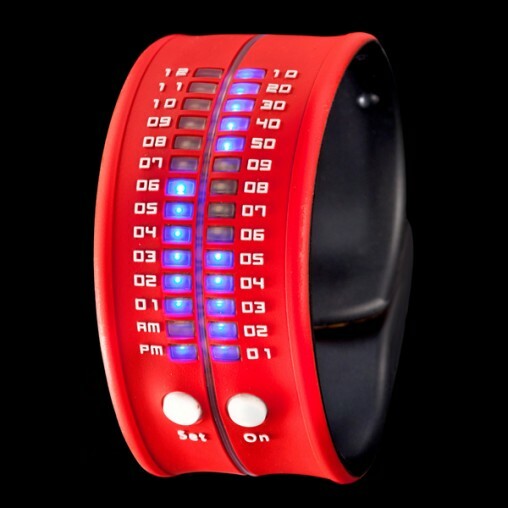 The Ritmo Mundo Reflex is a watch, albeit a fun-looking, LED-laden one. You have to make a tiny effort to tell the time, reading the time from three different banks of LEDs, but it’s really not that complicated. It is however much more expensive than the toys of 20 years ago: $150.